What is it? Massive expansion that adds new nemesis bosses, resistance factions, resistance heroes, and sweet shoulder pads. Just when you think life in XCOM is hard enough, the aliens send super-powered specialists to steal your money, take your soldiers and taunt you while they're doing it. War of the Chosen adds three characterful bosses that harass you in missions and on the campaign map until you manage to hunt them down and hit them at home. You have to deal with them in addition to your normal XCOM 2 duties—contacting new continents, researching the alien threat and beating back the Avatar project. This is a huge, rich expansion, albeit one for experienced commanders already comfortable with XCOM 2's vanilla campaign. You have some help, fortunately, in the form of three new resistance groups. Earn their trust and they will help you to chase down the Chosen, and give you access to powerful specialist class options: skirmishers, templars, and reapers. These are the most powerful and exciting troops in the whole Firaxis XCOM series so far. Templars are roaming assassins that can dart out of cover, kill an enemy with their psionic blades, and dart back into cover again. Skirmishers can use their grappling hook and high movement speed to zip around the battlefield and drag enemies out of position. Reapers can remain in stealth for most of a battle, with a bit of luck. They can blow up scenery with a well-placed shot and throw claymores without breaking stealth. The Chosen and the resistance factions are woven seamlessly into the familiar XCOM 2 campaign structure. The Chosen have their own introductory cutscenes and missions, and will turn up in key campaign missions to give you something extra to deal with. Each Chosen sets up in a particular continent on the campaign map, and they are much more likely to attack you in their area. Their primary aim is to daze and kidnap soldiers to increase their 'knowledge' bar. As this grows they gain extra battlefield strengths and new ways to sap your resources on the campaign map. If it maxes out they can attack your base directly. The Chosen are a threat, but are by no means invincible. They have a randomised set of weaknesses that causes them to take extra damage from certain sources—eg. explosive damage, or massed attacks in a single turn. They also each take additional damage from one of the resistance factions. This encourages you to build squads that can match a Chosen's weaknesses if you are fighting in their domain, and makes the Avenger's positioning on the world map matter more. War of the Chosen gives you plenty of soldiers and resources to develop this flexibility. The expansion broadens the game rather than extending it beyond XCOM 2's story arc. I found myself playing a lot more missions and levelling more soldiers than a typical playthrough. While it is tiresome to move through the same old plot points, the expansion does a good job of refreshing ordinary missions with new terrain and scenarios. The most striking mission change is the addition of lost cities, which are populated by hordes of humans turned feral and mindless by alien toxins (zombies, then). Every successful shot you take against these easily-hit targets generates an extra action. This encourages you to empty every soldier's clip into the hordes each turn as your squad rushes for extraction. These are especially novel when there is a Chosen on the map engaging in a two-way fight with the undead and your XCOM troops. Most of the new mission types are great with the sole exception of stealth missions, which you use to break allies out of Chosen prison. XCOM 2 is still unclear about whether a patch of ground is visible to an enemy or not. You can move to a supposedly safe part of the grid, shown in blue, only for the fog of war to peel back and reveal a turret a couple of metres away. When you get used to XCOM you learn to play around these situations with very cautious moves, but the system doesn't quite behave sensibly. Battles are generally more exciting for the extra toys, the resistance classes and dozens of small improvements. When you mouse over a position you can press a button to see if you will be in a flanking relationship to an enemy, which brings vital clarity to flanking moves. Units earn ability points for successful flank and high-ground attacks, and for defeating the Chosen. Resistance soldiers use these to level up on their special skill trees, but you also build a pool of points for your generic XCOM soldiers. You can build a new training room to spend these points on additional abilities to help bring a handful of your favourite soldiers closer to the power level of a resistance fighter. While the expansion is tailored to seasoned XCOM players, the ability point rewards teach good practice in combat. Flanking moves and high-ground attacks give you significant buffs to your hit percentages. Soldiers also form affinities for squadmates, which can grow into a buddy link. Once per fight a buddy can give their buddy an extra action in a turn. This might not sound like much but it has a many tactical uses. It's useful to have a vital reload or extra shot if you need something dead, or you can use it to give your buddied soldier a move out of danger. You can 'train' friendships to deepen bonds and access new abilities. In a particularly nice touch, a soldier that loses a buddy in battle goes into a frenzy and starts shooting every alien they can see. You can 'train' friendships to deepen bonds and access new abilities. In a particularly nice touch, a soldier that loses a buddy in battle goes into a frenzy and starts shooting every alien they can see. There's more. So much more. You can create propaganda posters of your units to celebrate victories and memorialise losses. This is a fun way to immortalise your favourite characters using a surprisingly well-featured editor. They populate the Avenger and turn up as posters in battles. There are also lots of new resistance-themed cosmetics with a spiky, leathery Mad Max vibe, which contrast nicely with the sleek, high-tech templars and skirmishers. Advent's roster has expanded. Red Advent soldiers torch zones of the battlefield with their flamethrowers. Psionic Advent troopers freeze your troops with stasis and put protective bubbles around alien units. They add some extra tactical variety to the early game in particular, when you would ordinarily be fighting boring basic troops. Befriending resistance groups also gives you specialised buffs that can help you on the strategy layer (by instantly letting you clear a room in the Avenger, for example) or in combat, where my troops currently run faster while stealthed during the opening turns of a fight. War of the Chosen is a comprehensive expansion that touches every aspect of the game. In the battle layer it's a resounding success, but on the strategic layer where you build rooms and move the Avenger around the world to pick up resources the expansion introduces some bloat. A high volume of missions, new rooms to build, new tech to research and covert actions slow down the overall progression. A day in War of the Chosen involves a lot more work than a day in vanilla XCOM 2. This makes clearing rooms and researching technology a longer, more frustrating process. Covert actions are a good feature, though. They are a vital tool that gives you a quick way to build relationships with resistance groups, hunt down the Chosen and gather extra supplies, scientists and engineers. You have a limited selection of covert actions available and you can only attempt one at a time. To complete one you devoting the requisite number of soldiers to the mission for a week or so of in-game time. These are important decisions and, crucially, they only pop up every now and then. Between covert action decisions expect to be bombarded relentlessly by mission opportunities, Chosen attacks, avatar project notifications and more. 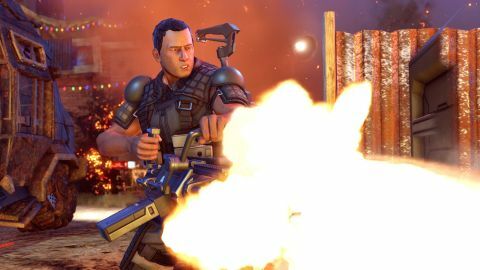 XCOM 2 is all about pushing you onto the back foot and making you fight out of a tough corner, and mandatory missions and dark events are part of that. However War of the Chosen simply piles more on top of your old problems, to the point where the push to new technology, five and six-person squads, a built-up Avenger feels like admin rather than the desperate fight-to-fight survival experience of early XCOM 2 playthroughs. Matters improve as you move out of the early game and all the resistance heroes and Chosen warriors have been introduced—at this point you start chasing the cool new resistance abilities—but the pace of the game has been substantially altered. This isn't entirely bad. The campaign drags at times, but the quality of the new resistance super-soldiers and obnoxiously chatty blue supervillains makes it a must-buy for avid XCOM 2 fans, and the increase in missions gives you more opportunities to play with the new gear. If the rhythms of XCOM 2 feel stale now, the expansion does enough to shake things up, just expect a slightly slower pace as you systematically pull apart those new alien champions.